"Marvin Gaye" is the debut single recorded by American singer Charlie Puth featuring American singer-songwriter Meghan Trainor. Atlantic Records released it on February 10, 2015, as the lead single from Puth's debut album, Nine Track Mind (2016), which first appeared on his third EP, Some Type of Love (2015). Puth co-wrote it with Julie Frost, Jacob Luttrell and Nick Seeley, and produced it alone. "Marvin Gaye" topped the charts in the United Kingdom, Ireland, France, and New Zealand, and peaked within the top five in Australia. Marc Klasfeld directed the music video, which was released on April 1, 2015. "Marvin Gaye" has been performed at The Today Show. Puth and Trainor performed it at the 2015 American Music Awards, which ended with a kiss between the two, attracting media attention. It appears on the set list for all of his concert tours, as well as Trainor's MTrain Tour (2015), on which Puth served as an opening act. An 18-second sample of the chorus, where the lyrics are "an effort to spark romance and get that special someone in the mood." Charlie Puth began his music career on YouTube, gaining attention after recording with Emily Luther a cover of Adele's "Someone Like You". The two appeared on The Ellen DeGeneres Show and signed with Ellen's record label, eleveneleven. After gaining further attention, Puth signed with Atlantic Records in January 2015. Puth and Meghan Trainor announced a duet, and "Marvin Gaye" was released as Puth's debut single on February 10, 2015. Puth said during an interview with Billboard that he had come up with the drumbeat for "Marvin Gaye" while sitting at a cafe in Hollywood, adding that he and Trainor "were at a party one night, and we were exchanging the new music, and she heard "Marvin Gaye" and asked, "Who else is singing on this? It should be a duet. Let me sing on it!" So I'm like ... OK, Meghan Trainor just asked me to sing on my song, absolutely! In one day, she knew the whole thing. We did it all in one take." "Marvin Gaye" is a reference to the soul singer with "the lyrics of the tune being an effort to spark romance and get that special someone in the mood, just as many Gaye slow jams have done for millions in the past." The song is also Trainor's first release without writing credits. The collaboration led to Puth's appearance as one of Trainor's dates in the music video for her single "Dear Future Husband". In Oceania, "Marvin Gaye" became a commercial hit, peaking at number one in New Zealand and number four in Australia. It was later certified Platinum by Recorded Music New Zealand (RMNZ) and 2× Platinum by the Australian Recording Industry Association (ARIA). In the United States, the song debuted at number 87 on the Billboard Hot 100 before peaking at number 21, making it Puth's second consecutive top 40 hit in the United States. In the United Kingdom, the song debuted at number 90 on the UK Singles Chart before ascending to the top of the chart the following week, becoming both Puth and Trainor's second chart-topping single in Britain after "See You Again" and "All About That Bass" respectively. In the Republic of Ireland, "Marvin Gaye" debuted at number 97 on the Irish Singles Chart before peaking at number-one five weeks later. The song's accompanying music video was directed by Marc Klasfeld and released via YouTube on April 1, 2015. It follows a dance in school where all in attendance "start making out on the floor, including the chaperones". The video closes with Puth and Trainor kissing. The video featured a strong product placement for Fiat's then new 500 1957 Edition and was used prominently in the company's advertising. The song has been performed at The Today Show. Puth and Trainor performed "Marvin Gaye" during the 2015 American Music Awards on November 22, 2015. Like the music video, the performance ended with a kiss between the two. This led to speculation that the two were in a romantic relationship. Puth denied this, stating that he and Trainor are just "friends" and the kiss was only meant to keep the performance within the theme of the song. He further said, "There was a lot of making out. The dancers were making out and I'm sure some of the other dancers were making out. I think that's it though". An alternate version of "Marvin Gaye" was released replacing Meghan Trainor with rapper Wale. The remix is featured on the Japanese edition of Puth's album Nine Track Mind. ^ a b c "Marvin Gaye (feat. Meghan Trainor) – Single". iTunes Store (United States). Archived from the original on April 16, 2015. Retrieved April 17, 2015. ^ a b c d "Introducing Charlie Puth: Atlantic Records' Next Pop Music Sensation With Soul!". clizbeatz.com. Retrieved April 25, 2015. ^ a b c "Charlie Puth Has The Number One Song In The Country... So Who Is He?". Forbes. Retrieved April 25, 2015. ^ "Atlantic Records signs the next YouTube star, Charlie Puth - 'Marvin Gaye' single with Meghan Trainor". next2shine.com. Retrieved April 25, 2015. ^ a b "Meghan Trainor Teams Up With Newcomer Charlie Puth On "Marvin Gaye"". idolater.com. Retrieved April 25, 2015. ^ a b "Charlie Puth Talks Meghan Trainor Duet 'Marvin Gaye' and His Plea to James Taylor". Billboard. Retrieved April 26, 2015. ^ a b "Charts.nz – Charlie Puth feat. Meghan Trainor – Marvin Gaye". Top 40 Singles. Retrieved May 20, 2015. ^ a b "Australian-charts.com – Charlie Puth feat. Meghan Trainor – Marvin Gaye". ARIA Top 50 Singles. Retrieved May 16, 2015. ^ Gary Trust (June 24, 2015). "Wiz Khalifa's 'See You Again' Leads Hot 100 for 10th Week". Billboard. (Prometheus Global Media). Retrieved June 24, 2015. ^ a b "Chart Track: Week 33, 2015". Irish Singles Chart. Retrieved August 14, 2015. ^ "Premiere: Charlie Puth And Meghan Trainor Get Down And Dirty In New Video". buzzfeed.com. Retrieved June 7, 2015. ^ "Charlie Puth – Marvin Gaye ft Meghan Trainor [Official Music Video]". YouTube. Retrieved April 17, 2015. ^ "Love Wiz Khalifa's "See You Again"? You Need to Check Out This Video". popsugar.com. Retrieved April 25, 2015. ^ "Meghan Trainor's On-Screen Kiss With Charlie Puth Was 'So Awkward'". MTV. Retrieved April 25, 2015. ^ "Fiat 500 Vintage 57". TVadmusic.com. June 2, 2015. ^ "UK Top Shazamed Ads: 'Marvin Gaye' by Charlie Puth feat. Meghan Trainor earns Fiat the top spot". TheDrum.com. June 9, 2015. ^ "Are Charlie Puth and Meghan Trainor Dating! (Hint: No!)". MSN.com. Retrieved December 22, 2015. ^ "Charlie Puth - Marvin Gaye ft. Wale [Remix]". YouTube. Retrieved December 22, 2015. ^ "ナイン・トラック・マインド[特別価格]". Retrieved 2 November 2017 – via Amazon. ^ "Austriancharts.at – Charlie Puth feat. Meghan Trainor – Marvin Gaye" (in German). Ö3 Austria Top 40. Retrieved October 22, 2015. ^ "Ultratop.be – Charlie Puth feat. Meghan Trainor – Marvin Gaye" (in Dutch). Ultratop 50. Retrieved October !6, 2015. ^ "Ultratop.be – Charlie Puth feat. Meghan Trainor – Marvin Gaye" (in French). Ultratop 50. Retrieved January 16, 2016. ^ "Charlie Puth Chart History (Canadian Hot 100)". Billboard. Retrieved September 30, 2015. ^ "ČNS IFPI" (in Czech). Hitparáda – Radio Top 100 Oficiální. IFPI Czech Republic. Note: Change the chart to CZ – RADIO – TOP 100 and insert 201551 into search. Retrieved December 22, 2015. ^ "ČNS IFPI" (in Czech). Hitparáda – Digital Top 100 Oficiální. IFPI Czech Republic. Note: Change the chart to CZ – SINGLES DIGITAL – TOP 100 and insert 201543 into search. ^ "Danishcharts.com – Charlie Puth feat. Meghan Trainor – Marvin Gaye". Tracklisten. Retrieved September 23, 2015. ^ "Charlie Puth – Chart history" Billboard Euro Digital Songs for Charlie Puth. Retrieved 22 August 2015. ^ "Charlie Puth Feat. Meghan Trainor: Marvin Gaye" (in Finnish). Musiikkituottajat – IFPI Finland. Retrieved 2 May 2016. ^ "Lescharts.com – Charlie Puth feat. Meghan Trainor – Marvin Gaye" (in French). Les classement single. Retrieved October 12, 2015. ^ "Offiziellecharts.de – Charlie Puth feat. Meghan Trainor – Marvin Gaye". GfK Entertainment. Retrieved August 24, 2015. ^ "Archívum – Slágerlisták – MAHASZ" (in Hungarian). Single (track) Top 40 lista. Magyar Hanglemezkiadók Szövetsége. Retrieved October 22, 2015. ^ "Charlie Puth & Meghan Trainor Chart History". RÚV. Retrieved July 12, 2017. ^ "Charlie Puth feat. Meghan Trainor – Marvin Gaye Media Forest". Israeli Airplay Chart. Media Forest. Retrieved September 27, 2015. ^ "Italiancharts.com – Charlie Puth feat. Meghan Trainor – Marvin Gaye". Top Digital Download. Retrieved September 23, 2015. ^ "Billboard Japan Hot 100" (in Japanese). Billboard Japan. Retrieved June 4, 2015. ^ "Luxembourg Digital Songs chart History - Charlie Puth". Billboard. Retrieved June 30, 2017. ^ "Marvin Gaye - Charlie Puth Featuring Meghan Trainor". Billboard. Prometheus Global Media. Archived from the original on July 28, 2015. Retrieved July 28, 2015. ^ "Nederlandse Top 40 – Charlie Puth feat. Meghan Trainor" (in Dutch). Dutch Top 40. Retrieved October 23, 2015. ^ "Dutchcharts.nl – Charlie Puth feat. Meghan Trainor – Marvin Gaye" (in Dutch). Single Top 100. Retrieved December 12, 2015. ^ "Norwegiancharts.com – Charlie Puth feat. Meghan Trainor – Marvin Gaye". VG-lista. Retrieved October 24, 2015. ^ "Listy bestsellerów, wyróżnienia :: Związek Producentów Audio-Video". Polish Airplay Top 100. Retrieved September 14, 2015. ^ "Official Scottish Singles Sales Chart Top 100". Official Charts Company. Retrieved August 15, 2015. ^ "ČNS IFPI" (in Slovak). Hitparáda – Radio Top 100 Oficiálna. IFPI Czech Republic. Note: insert 201527 into search. Retrieved July 27, 2015. ^ "ČNS IFPI" (in Slovak). Hitparáda – Singles Digital Top 100 Oficiálna. IFPI Czech Republic. Note: Select SINGLES DIGITAL - TOP 100 and insert 201533 into search. ^ "SloTop50 – Slovenian official singles chart". slotop50.si. Retrieved 18 July 2018. ^ "Spanishcharts.com – Charlie Puth feat. Meghan Trainor – Marvin Gaye" Canciones Top 50. Retrieved November 24, 2015. ^ "Swedishcharts.com – Charlie Puth feat. Meghan Trainor – Marvin Gaye". Singles Top 100. Retrieved September 14, 2015. ^ "Swisscharts.com – Charlie Puth feat. Meghan Trainor – Marvin Gaye". Swiss Singles Chart. Retrieved October 12, 2015. ^ "Official Singles Chart Top 100". Official Charts Company. Retrieved August 14, 2015. ^ "Charlie Puth Chart History (Hot 100)". Billboard. Retrieved September 29, 2015. ^ "Charlie Puth Chart History (Adult Contemporary)". Billboard. Retrieved September 1, 2015. ^ "Charlie Puth Chart History (Adult Pop Songs)". Billboard. Retrieved December 26, 2015. ^ "Charlie Puth Chart History (Pop Songs)". Billboard. Retrieved December 26, 2015. ^ "ARIA Charts - End of Year Charts - Top 100 Singles 2015". Australian Recording Industry Association. Retrieved January 6, 2016. ^ "Jahreshitparade 2015" Archived 2016-01-04 at the Wayback Machine (in German). Austrian Charts Portal. Hung Medien. Retrieved December 8, 2016. ^ "Rapports annuels 2014". Ultratop. Retrieved December 8, 2016. ^ "Canadian Hot 100 Year End 2015". Billboard. Retrieved 9 December 2015. ^ "TRACK TOP-100 2015". Tracklisten. Retrieved January 6, 2016. ^ "Top 100 Single-Jahrescharts". GfK Entertainment (in German). offiziellecharts.de. Retrieved 6 January 2016. ^ "Israel Airplay Year End 2015". Retrieved January 5, 2016. ^ "Classifiche "Top of the Music" 2015 FIMI-GfK: La musica italiana in vetta negli album e nei singoli digitali" (in Italian). Federazione Industria Musicale Italiana. Retrieved January 13, 2016. ^ "Top Selling Singles of 2015". Recorded Music NZ. Retrieved December 25, 2015. ^ "Airplay – podsumowanie 2015 roku" (in Polish). Polish Society of the Phonographic Industry. Retrieved December 30, 2015. ^ "Årslista Singlar – År 2015" (in Swedish). Sverigetopplistan. Swedish Recording Industry Association. Retrieved December 8, 2016. ^ "The Official Top 40 Biggest Songs of 2015 revealed". Retrieved January 4, 2016. ^ "Hot 100: Year End 2015". Billboard. billboard.com. Retrieved December 9, 2015. ^ "SloTop50: Slovenian official year end singles chart". slotop50.si. Retrieved 31 December 2017. ^ Ryan, Gavin (August 8, 2015). "ARIA Singles: One Direction 'Drag Me Down' Is No 1". Noise11. Retrieved August 8, 2015. ^ "Austrian single certifications – Charlie Puth feat. Meghan Trainor – Marvin Gaye" (in German). IFPI Austria. Retrieved August 19, 2015. Enter Charlie Puth feat. Meghan Trainor in the field Interpret. Enter Marvin Gaye in the field Titel. Select single in the field Format. Click Suchen. ^ "Ultratop − Goud en Platina – singles 2016". Ultratop. Hung Medien. Retrieved March 19, 2015. ^ "Canadian single certifications – Charlie Puth feat. Meghan Trainor – Marvin Gaye". Music Canada. Retrieved July 12, 2018. ^ "CHARLIE PUTH FEAT. MEGHAN TRAINOR "MARVIN GAYE"" (in Danish). IFPI Denmark. Retrieved March 12, 2016. ^ "Gold-/Platin-Datenbank (Charlie Puth; 'Marvin Gaye')" (in German). Bundesverband Musikindustrie. Retrieved March 11, 2016. ^ "Italian single certifications – Charlie Puth feat. Meghan Trainor – Marvin Gaye" (in Italian). Federazione Industria Musicale Italiana. Retrieved March 7, 2017. Select "2017" in the "Anno" drop-down menu. Select "Marvin Gaye" in the "Filtra" field. Select "Singoli online" under "Sezione". ^ "New Zealand single certifications – Charlie Puth feat. Meghan Trainor – Marvin Gaye". Recorded Music NZ. Retrieved July 3, 2015. ^ "Troféoversikt - Marvin Gaye" (in Norwegian). IFPI Norway. Retrieved May 9, 2015. ^ (in Spanish) "Charlie Puth - Marvin Gaye feat Meghan Trainor". Portal de Música. Retrieved November 5, 2015. ^ "Guld- och Platinacertifikat" (in Swedish). IFPI Sweden. Retrieved December 5, 2018. Type Charlie Puth feat. Meghan Trainor in the top right search bar. Click on "Sok" and select "Visa" under Marvin Gaye to see certification. ^ "The Official Swiss Charts and Music Community: Awards (Charlie Puth feat. Meghan Trainor; 'Marvin Gaye')". IFPI Switzerland. Hung Medien. Retrieved March 12, 2016. ^ "British single certifications – Charlie Puth – Marvin Gaye". British Phonographic Industry. Retrieved October 9, 2015. Select singles in the Format field. Select Platinum in the Certification field. Type Marvin Gaye in the "Search BPI Awards" field and then press Enter. 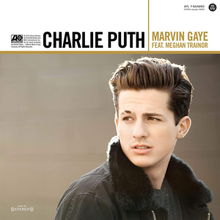 ^ "American single certifications – Charlie Puth – Marvin Gaye". Recording Industry Association of America. Retrieved August 10, 2016. If necessary, click Advanced, then click Format, then select Single, then click SEARCH. This page was last edited on 18 April 2019, at 11:38 (UTC).